As a battle with the Cylons rages in space outside the agro ship Rhea, the captain of the vessel has an interlude with his frightened son. 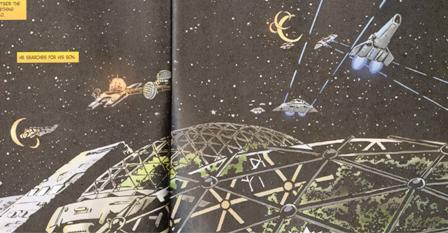 On pages 2-3 of the story, we see at least two agro ships in the fleet during the battle with the Cylons. Since only one agro ship was left after the Cylon attack in "The Magnificent Warriors", I'm assuming that the battle seen here is actually another view of that same battle, shortly before the destruction of two of the agro ships. The agro ship on which this story takes place is the Rhea. But what should be the last remaining agro ship is referred to merely as Agro Ship 9 in "War of the Gods" Part 2. One might be led to believe that the Rhea was one of the ships destroyed in "The Magnificent Warriors". It's implied that Captain Jor is the commander of the Rhea. This story would appear to have been inspired by aspects of the Superman mythology from DC Comics. Here, the boy's father is named Jor and the boy himself is Kel; in the Superman comic books, Superman's Kryptonian father is Jor-El and Superman's Kryptonian birth name is Kal-El. The faces and hair of Jor and Kel are also reminiscent of Superman's. Additionally, Superman is occasionally known as the "favorite son" of Metropolis or Krypton. 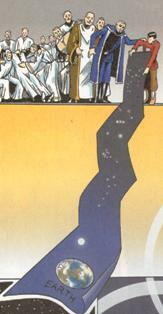 On pages 1-2 of the story, the crescent shapes of a number of worlds are seen in the background starfield. But the openings of the crescents are pointing every which way; this would only be possible in a multi-star system and many of the worlds are seen too close together to be under separate lighting influences. Also, a planetary or lunar crescent is caused by the shadow of a world blocking the path of sunlight, and yet this contradictorily does not appear to be the case in some of the images seen here; crescents are seen for no reason. On page 2 of the story, several of the above-mentioned crescent worlds have stars or other worlds shining through the occluded portions! This would not be possible as even the dark part of the crescent still has a solid body behind it. On page 5 of the story, why does one member of the Council of Twelve appear to have passed out? Is it because the young boy appears to be pointing the way to Earth at long last? Notice also that the star map that symbolizes the way to Earth on page 5 shows constellations familiar to us here on Earth. The one at the top may be Pegasus. The second and fourth from the top are the Little Dipper and Orion. I'm not sure of the third from the top (maybe Capricorn?). On page 8, notice that Jor and Kel are visible not only through the dome of the agro ship and the canopy of the approaching Cylon Raider, but on the Raider cockpit's scanner as well. It appears the Raider's pilots were targeting them. On the last, single-panel-page of the story, the Viper pilot can be identified, from the cigar sticking from the side of his mouth, as Starbuck, who is about to blow away the Raider which is targeting the Rhea. 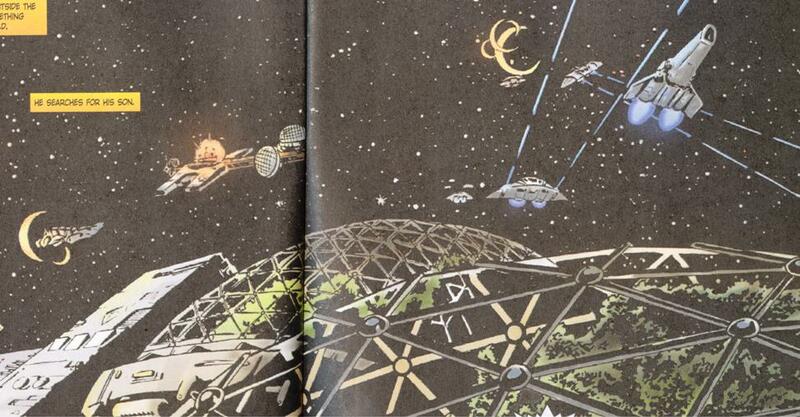 If the space battle seen here is indeed the same one seen in "The Magnificent Warriors" as I speculated above, then is the Rhea the agro ship that survives that battle? Or was it one of the two destroyed and Jor and Kel killed along with it? The last page of the story (see paragraph above) would seem to suggest that this ship will make it, yet the surviving agro ship has a different name in the later "War of the Gods" Part 2.